Shade sails are made up of two separate components, the post or frame, and the sails or canopy. We design and manufacture both components at our site on the Gold Coast. 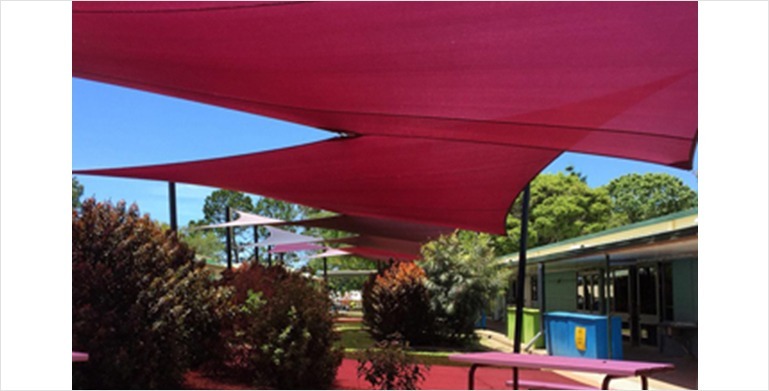 Shade sails can be designed to accommodate almost any application that requires shade and/or protection from weather. Posts or frames are used as the structure for most applications involving shade sails or canopies in both commercial and domestic uses. Our posts and frames are custom made from galvanised steel to the exact specifications required for each individual job. Posts are made to accommodate the size and height of the shade sail or canopy design. We paint all our frames and posts with one coat of ultra-etch primer followed by powder coating in colour of your choice. The material options available for our waterproof shade sails are DRI-Z and Ferrari 502 PVC. During the manufacture process of our waterproof sails the seams are frequency welded and all corners of the sails are fitted with stainless steel plates top and bottom for tensioning purposes. Stainless steel wire is also installed around the perimeter and inside the edges for adjusting and tensioning. Warranty 5 years limited. DRI-Z has been tested under CSIR under wind conditions in excess of 200km/h. Our PVC clear blinds have frequency welded seams and the perimeters have a 50mm Ferrari 502 PVC reinforcement. You can choose the colour for the zippers which get sewn onto Ferrari 502 PVC material. We can supply robes, pulleys, and tie-downs where requested. any commercial or residential job. Anthony Shade Sails were fantastic. Showed up on time and completed a site check and designed a solution for our beach house that was complimentary to the structure. Price was very reasonable . The work was completed on time. Custom made shade sails are not do it yourself types. My wife and I couldn't have been happier with the quality and design. Quality product. Great service from everyone involved. We knew what we wanted & they made it happen. Very, very happy with the end result guys. Thank you all so much. Sensational service, very quick turn around, 100% happy with end product, Ladies in office very professional with my payment process. Would highly recommend to anyone. Staff were great and I couldn't be happier with the double shade sale they built and installed over my children's playground!